AirPlay started life as AirTunes and was originally limited to streaming audio from iTunes on a Mac or PC to Apple's AirPort Express - a Wi-Fi basestation that has audio connectors for hooking up to a stereo system. Later, it was added as an option in the iOS Remote app, allowing you to control the music you played over AirTunes from an iPhone, iPod touch or iPad. In late 2010, AirTunes became AirPlay and added the ability to stream photos, video and metadata. 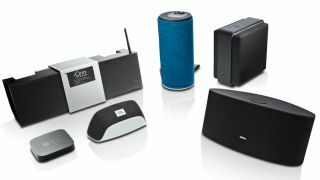 More excitingly, however, Apple also announced that it had licensed AirPlay to third parties, so that they could produce AirPlay speaker systems. There are several ways that you can use AirPlay. You can stream music from iTunes on a Mac to an Apple TV, AirPort Express or third-party system. Or you can play music from the Music app on your iPhone, iPad or iPod touch to the same devices. Some third-party apps also support streaming audio and/or video using AirPlay. Apple's proprietary technology can even be used as a way of streaming music from your Mac wirelessly to different rooms around your house. Then there's mirroring, which allows you to send the audio and video output of an iOS device or Mac running Mountain Lion to an Apple TV. AirPlay mirroring can be used for a whole range of activities, from playing Keynote presentations on a large-screen TV, to sharing creations in iMovie, and even as a way of playing, say, a YouTube guitar tutorial or cookery videos on a television rather than a smaller screen. One of our favourite uses, however, is for gaming. Developers have been quick to explore the possibilities of AirPlay mirroring in games, most commonly allowing you to use your iPhone or iPad as a controller while displaying the game itself on TV. AirPlay is both easy to use and flexible. From iTunes on a Mac, or the Remote app in iOS, you can send tracks from your Mac's music library to multiple AirPlay speakers around the house. There's much more to AirPlay than meets the eye, and this article we'll tell you all you need to know to get more from it. We'll also tell you which AirPlay speaker systems work best in different locations and why they're worth your money. Setting up an AirPlay device can be done in a number of ways, depending on which device you're using. Some have a dedicated iOS app to handle the heavy lifting, others use Wi-Fi sharing, some have on-board LCDs and menu systems, and one or two require you to connect directly to your Mac using a USB cable, or a router using an Ethernet cable, in order to configure them. The easiest device to set up is an Apple TV. Connect it to your TV with an HDMI cable, then follow the on-screen instructions to add it to your Wi-Fi network. The trickiest bit used to be entering your Wi-Fi password using the remote control, but Apple TV now supports Bluetooth keyboards, so even that bit is easy. Once it's connected, your Mac and iOS devices find it automatically and it's available in the AirPlay menu in apps that support it, as well as the multitasking bar in iOS. Setting up a device that supports Wi-Fi Sharing is just a matter of connecting a device running iOS 5 or 6 and maybe pressing a button on the speaker. It will then harvest the details of the network to which your device is connected and add itself, once you've given it permission. Some devices - the Libratone Zipp, for example - require that you join their own network from an iOS device or Mac and then navigate in a web browser to their configuration page where you define your own Wi-Fi network.